There are no AuroraWatch alerts currently in effect for this evening. This message was last updated at 7:01 AM on 23 April 2019 MDT. 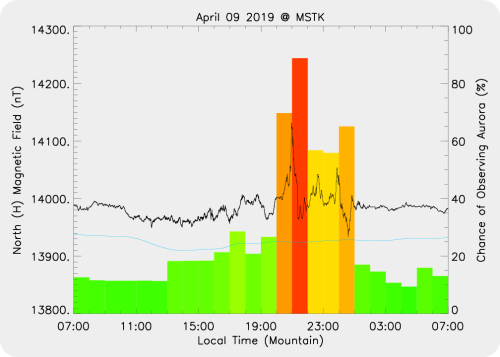 An AuroraWatch yellow alert was issued at 9:10 PM on 9 April 2019 MDT. This alert was in effect until 7:00 AM on 10 April 2019 MDT, indicating there was an increased chance (>~50–60%) of Auroral activity. The weather conditions were reported as Mostly Cloudy at the Edmonton Airport at the time of the alert.